In the town where I live winter is ranging now. Despite the fact that the town is rather southern, we have snow everywhere. Strong wind and temperatures below zero make us hurry up to homes to spend an evening in warmth and comfort. Such an evening will be ideal if it also includes a delicious dinner. 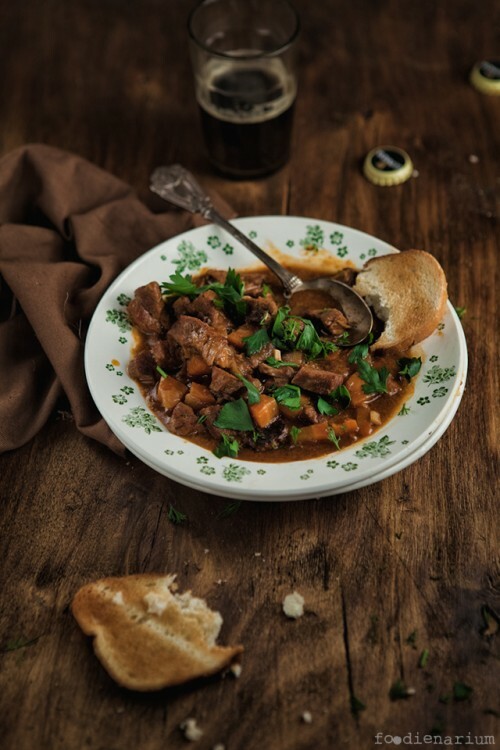 Irish stew can easily be a part of such a dinner. It is called Irish because the beef is cooked in the famous Irish dark beer Guinness. Thus we get the beef very tasty and flavored. Irish stew is a celebrated Irish dish. It’s recognized as early as about 1800. We won’t be cooking a traditional version but an easy one. Wash meat and cut into 2 cm (1 inch) cubes. Put it into a bowl with 2 tablespoons of olive oil. In another bowl mix flour, salt and pepper. Roll meat in this mixture while a deep frying pan is heating (deep stewing pan). Fry the meat over medium heat for about 8 minutes in the remaining oil. Add the finely chopped onion, chopped garlic, tomato paste, cover the pan with a lid and stew for 5 minutes over low heat. After that pour beer into meat, add chopped carrots and a sprig of thyme, stir and stew for 2-3 hours under the closed lid. Sometimes open the lid and stir the stew. It’s better to serve the stew with boiled potatoes and generously sprinkled with parsley.